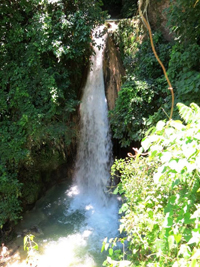 Accentuating Carmen’s status as the oasis in northern Cebu is the Mangitngit Falls, one of the very few waterfalls in the entire northeastern Cebu stretch. Surrounded by trees and shrubs, the green and serene environment at the falls are broken only by the sound of gushing water that is soothing to the senses. This beauty can be reached through the rough, winding roads of barangay Corte, passing by other famous landmarks such as the Durano Ecofarm, the Uragay Spring, and the St. Benedicts Monastery. The scenic journey to the waterfalls is in itself a joy: the view of the green hills and mountains is refreshing. The Mangitngit Falls feeds four swimming pools constructed that is now the Middle Earth Resort. © 2016-2018 Municipality of Carmen. All rights reserved.